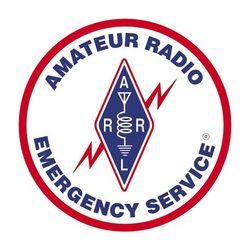 The entire State of Florida was placed under an Amateur Radio Emergency Service (ARES) Level 1 -- or full -- activation on October 6, as Hurricane Matthew headed for landfall in the US. The category 4 storm has already caused more than 100 deaths, most of them in Haiti, as it moved northward through the Caribbean. The Northern Florida ARES Net was called up on 3950 or 7242 kHz -- depending upon propagation -- and will remain operational for the duration of the threat. "This net is for life safety communications," ARRL Northern Florida Section Manager Steve Szabo, WB4OMM, stressed. "This net is not for collecting weather data, idle conversations, or 'chit chat.'" The Statewide Amateur Radio Network (SARnet) also has been activated for statewide use for life safety communications, continuing until terminated. SARnet is a network of linked UHF repeaters serving Florida. "Hurricane Matthew relentlessly pounding the Bahamas...potentially disastrous impacts for Florida," is how the National Hurricane Center (NHC) in Miami characterized the storm, which, at 1800 UTC, was about 65 miles south-southeast of Nassau, the Bahamas, and 125 miles east-southeast of West Palm Beach, Florida. Matthew has maximum sustained winds of 140 MPH and is moving northwest at 14 MPH. More than 3,000 Florida residents already had evacuated to shelters by October 6, according to FEMA. Florida Gov Rick Scott said residents should prepare for a direct hit on the state. "This is serious," he said. "Don't take a chance." For more information on hurricane preparedness, visit the Ready.gov website or read the American Red Cross "Hurricane Safety Checklist." The ARRL Headquarters Emergency Response Team met on October 5. "We will be placing W1AW into emergency standby starting Friday morning, October 7, following the 8 AM ET bulletin," said ARRL Emergency Preparedness Manager Mike Corey, KI1U. "We will have W1AW staffed and ready to go on the air through late Friday night and on Saturday morning through evening. Saturday evening we will reassess the need to keep W1AW staffed over the weekend." Corey said that W1AW would monitor the Hurricane Watch Net (HWN), the SATERN Net, and the VoIP Hurricane Net. ARRL has been in touch with Field Organization volunteers in the US Virgin Islands and along the US Eastern Seaboard and will respond as needed. Hurricane Matthew information updates will be posted to the ARRL website. National SATERN Liaison Bill Feist, WB8BZH, reported on October 5 that Haiti was hit hard by Hurricane Matthew, and Jean-Robert Gaillard, HH2JR, in Port au Prince told SATERN that southern Haiti was "in bad shape." SATERN will remain active at a DELTA II (extended monitoring) status on 14.265 MHz at least through Friday, October 7. Cuban radio amateurs were reported active in the eastern provinces of that island nation, with operation on 2, 40, and 80 meters. IARU Region 2, Area C Emergency Coordinator Arnie Coro, CO2KK, reported that HF radio equipment was dispersed throughout eastern Cuba in advance of the storm. Poor propagation has hampered emergency communication on HF bands. All radio amateurs are asked to avoid transmitting on or near any emergency net frequencies. In addition, stations should not check into any emergency or weather information net unless they have something to contribute. The Hurricane Watch Net has been active all week on 14.325 and 7.268 MHz, gathering real-time "ground truth" weather data and storm-related information from affected areas. The net relays the information it compiles to forecasters via WX4NHC at the National Hurricane Center. The Federal Emergency Management Agency (FEMA) has announced it may use several 60 meter frequencies for interoperability with other authorized stations, federal government stations, and Amateur Radio stations during the Hurricane Matthew response. It is requested that all stations stay clear of these frequencies unless they have emergency traffic relative to Hurricane Matthew. 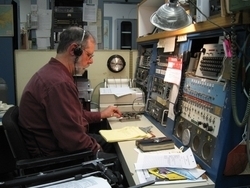 The Amateur Radio Service has secondary status on 60 meters. The suppressed-carrier frequencies (dial frequencies) are 5330.5 kHz, 5346.5 kHz, 5357.0 kHz, 5371.5 kHz, and 5403.5 kHz (USB). California has upped its game in cracking down on distracted driving, and radio amateurs there are concerned that a recent revision to the state's Motor Vehicle Code could affect Amateur Radio mobile operation. The old law, which included an Amateur Radio exemption, already prohibited motorists from using electronic wireless communication devices to write, send, or read a text-based communication while in motion, unless the device was configured for voice-operated and hands-free operation. The revised law does not exempt Amateur Radio. Assembly Bill 1785, signed into law on September 26 by Governor Jerry Brown, prohibits a motorist from driving "while holding and operating" a handheld wireless telephone or a wireless electronic communication device, as defined by the code. But it authorizes a driver to operate such devices mounted on a vehicle's windshield like a GPS or on the dashboard or center console "in a manner that does not hinder the driver's view of the road," if the driver can activate or deactivate a feature or function "with the motion of a single swipe or tap of the finger." The language defining devices covered by the law does not accurately specify what activity is prohibited, leaving its application subject to misinterpretation by individual law enforcement officers, but it does not specifically proscribe use of mobile Amateur Radio equipment for voice communication. The list of covered devices includes, but is not limited to, "a broadband personal communication device, a specialized mobile radio device, a handheld device or laptop computer with mobile data access, a pager, or a two-way messaging device." A first offense would incur a $20 base fine and $50 for subsequent offenses. 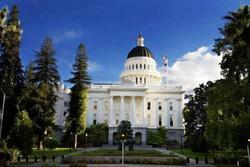 Initial wording of the legislation was not considered to be a threat to Amateur Radio operation, but the measure's language changed substantially as it worked its way through the California General Assembly. ARRL General Counsel Chris Imlay, W3KD, said there are two principal ways to protect Amateur Radio in this type of legislation. "One is by sufficiently narrowly defining prohibited activity so as to exclude Amateur Radio," he said. "The other is to create specific exemptions where the definitions are confusing. This new statute is an example of bad legislative draftsmanship. It creates a motor vehicle law with citations issued for certain activity that includes the words 'but is not limited to' in the language defining the violation." ARRL President Rick Roderick, K5UR, will head a contingent of League representatives at the 19th International Amateur Radio Union Region 2 (IARU-R2) General Assembly in Viña del Mar, Chile. The conference, hosted by the Radio Club of Chile, gets under way on October 10 and continues through October 14. An emergency communications workshop will be held on October 11 in conjunction with the IARU event. Attending on behalf of ARRL, in addition to President Roderick, will be Technical Relations Specialist Jon Siverling, WB3ERA; ARRL Second Vice President Brian Mileshosky, N5ZGT, and Emergency Communications Manager Mike Corey, KI1U. ARRL International Affairs Vice President Jay Bellows, K0QB, also will attend in his role as IARU Region 2 Area B Director. Changing references to the 660-meter band to 630 meters, to more accurately describe the wavelength of the spectrum actually allocated for Amateur Radio use. Updating the 160-meter band plan to acknowledge AM operations commonly encountered within the band. Adding an exception to the band plan to specify that, in the event a 60-meter Amateur Radio allocation is added to the band plan, upper sideband (USB) is permissible. Mexico's IARU member society FMRE plans to ask the Region 2 General Assembly to request that CITEL and the International Telecommunication Union (ITU) assist FMRE in its efforts to convince the Mexican government to allow foreign amateurs to operate in Mexico. Conference delegates also will elect IARU Region 2 officers and directors. At the Emergency Communications Workshop on October 11, IARU Region 2 emergency coordinators and other national-level Amateur Radio emergency communications experts will gather to share information and discuss how to increase the capacity for amateurs in Region 2 to respond to large-scale, multinational communication emergencies. The conference also will offer an opportunity for national-level Amateur Radio emergency communications leaders to network and increase the level of cooperation and collaboration within Region 2. Special event station XR2IARU will be on the air from the Hotel O'Higgins, the conference venue. "Bits vs. Baud" is the topic of the latest (October 6) episode of the "ARRL The Doctor is In" podcast. Listen...and learn! If you've never listened to a podcast before, download our beginner's guide. Just ahead on October 20, "HF Mobile Antennas." ARRL's National Parks on the Air (NPOTA) program remains on track to break 800,000 contacts from eligible NPS units before the end of the year! Some 1,200 Activators have made just over 700,000 contacts from nearly 460 of the 489 NPOTA units. With just under 3 months to go, there is still time for you to get in on the NPOTA hunt or to plan your own activation! The NPOTA page on the ARRL website has all the information you need to get started. There are 30 activations scheduled between October 6 and 12, including the Hubbell Trading Post National Historic Site in Arizona and the first activation of Coral Reef National Monument in the US Virgin Islands. An upgrade to the password checking mechanism that authenticates Logbook of The World (LoTW) users has caused log-in problems for some clients. Under the system in place prior to approximately 2300 UTC on September 19, the LoTW log-in system ignored the case of any characters in a password when checking for a match, storing them all as lowercase. The new system is case-sensitive, however. While passwords once were randomly generated, the ARRL IT staff recently implemented a new LoTW password mechanism that lets users choose their own passwords. Under this new system, when users first log in, their passwords are encrypted. Some users attempting to log in with mixed-case passwords were rejected, however, because the system had stored their passwords as all lowercase. A subsequent modification allows the system to accept a user's mixed-case password and changes the stored password to the user's mixed-case specification. The issue also can present problems for applications, such as logging programs, that employ a user's credentials to access a LoTW account. Users who encounter trouble logging in to LoTW are being asked to enter their passwords in all lowercase. If that doesn't work, contact the LoTW Help Desk or explore other methods available for LoTW. Any LoTW users who logged in before this modification was made -- at around 2300 UTC on September 19 -- had their passwords stored in lowercase, no matter which case they used in entering them. These passwords now must be entered as lowercase. Users who have changed to a new password with mixed-case letters must continue to enter their passwords in mixed-case letters. ARRL apologizes for underestimating the extent of the problems that would be caused by the lack of password case-sensitivity in the previous LoTW authentication mechanism. Greg Sarratt, W4OZK, has been declared elected as Director of the ARRL Southeastern Division, to take office at noon Eastern Time on January 1, 2017. Joe Tiritilli, N4ZUW, is also declared elected as Vice Director in the Southeastern Division. He has been appointed by ARRL President Rick Roderick, K5UR, to fill the vacant Southeastern Vice Director chair, effective immediately. Bob Wiseman, WB3W, of Schnecksville, Pennsylvania, has been appointed as the Interim Section Manager for the ARRL Eastern Pennsylvania Section. He is fulfilling the current term of office that was declared vacant by the ARRL Executive Committee of the ARRL Board of Directors this past June. Wiseman's interim appointment continues through March 31, 2018. Wiseman brings to the helm of the Eastern Pennsylvania Section his past experience as Section Emergency Coordinator, District Emergency Coordinator, and Official Emergency Station. US Air Force MARS Chief Dave Stapchuk, KD9DXM, will discuss the history of the Military Auxiliary Radio System (MARS) program and membership requirements for Amateur Radio operators. He also will highlight the Joint MARS Phone Patch network, which provides daily support to US armed forces. The phone patch network facilitates not only morale/welfare phone patches, but routinely handles mission-related radio calls and occasionally assists US air crews with in-flight emergency phone patches when air traffic control cannot be reached. US Army MARS Program Manager Paul English, WD8DBY, will discuss the quarterly US Department of Defense (DOD) contingency communication exercises, which promote interoperability between the Amateur Radio community and the DOD. English will also discuss initiatives for promoting the use of 60 meters between Amateur Radio and the federal government, as well as the types of information MARS operators will request from the Amateur Radio community during the upcoming quarterly DOD communications exercise (COMEX), October 30-November 1. Registrants will receive a confirming e-mail that contains information about joining the webinar. This means that, under some circumstances, Amateur Radio clubs would be able to accept donations and issue receipts for tax purposes, as well as enjoy other benefits. The forum will take place on Friday, October 14, at 3 PM. Clubs are invited to send one representative, as seating is limited. In a little more than a month, the venerable AO-7 Amateur Radio satellite will mark 42 years in space. AMSAT says AO-7, the oldest ham radio satellite still in operation, is now switching between Mode A and Mode B on a daily basis, after coming up in Mode A on September 30. "That suggests that the satellite is now in constant sunlight and receiving enough power from the solar cells for the 24-hour timer to stay on throughout its entire orbit," AMSAT-NA Secretary Paul Stoetzer, N8HM, said. "Expect daily mode switches between Mode A and Mode B to occur for the next 3 months or so. As AO-7's orbit precesses and the periods of constant sunlight become fewer and fewer, there will be less of an opportunity to use Mode A on a yearly basis, so enjoy it while it lasts!" In Mode A, earthbound amateurs transmit on 2 meters and receive on 10 meters. Stoetzer said the type of 10-meter antenna isn't fussy. "Try whatever you can," he said. When continuously illuminated, AO-7's mode will alternate between Modes A and B (70 centimeters up/2 meters down) every 24 hours. November 15 will mark 42 years since AO-7 was launched into space from Vandenberg Air Force Base in California. 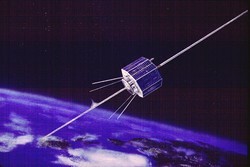 AO-7 was the second so-called "Phase 2" Amateur Radio satellite that AMSAT-NA constructed and launched into low-Earth orbit. It remained in operation until a short circuit occurred in a battery in 1981. More than 20 years later, however, AO-7 unexpectedly returned to life, its 2-meter beacon showing up on 145.9775 MHz. Satellite experts speculate that AO-7's resurrection occurred when the short circuit in the battery opened up for some reason, allowing the solar cells to power the spacecraft. When the satellite goes into eclipse, it powers down. Nearly 20 years after shore station KPH in California went dark, that call sign will be back on the air on Saturday, October 8, for a commemorative transmission, opening its doors to the public for the occasion. KPH will be operating from its original home on its original frequencies using its original transmitters, receivers, and antennas, "and even some of the original operators!" said Richard "RD" Dillman, W6AWO, of the Maritime Radio Historical Society (MRHS). Dillman explains that KPH began as station "PH" in San Francisco's Palace Hotel in 1905. Richard "RD" Dillman, W6AWO, at KPH. "It moved to several locations after the earthquake, ending up in Marin County north of San Francisco," Dillman said. "[KPH] continued to provide radiogram service to ships at sea until June 30, 1997, when the license was sold to a competitor. With the license went the iconic call KPH." Dillman said the MRHS began restoring the station in 1999 and obtained another commercial call sign, KSM, continuing to operate the KPH facility on KSM frequencies to provide service to ships. "But, of course, we wanted to get back the KPH call and the KPH frequencies, so the station would be exactly as it was when they closed the doors in 1997," Dillman told ARRL. That became a reality a few months ago, when the MRHS concluded an agreement with the current KPH licensee to add the Bolinas and Point Reyes sites to the license. That gave the MRHS authority to once again use the KPH call sign and frequencies. 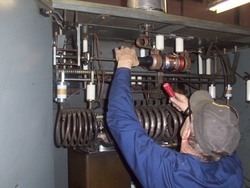 Steve Hawes adjusts a vacuum variable in the final tank circuit of a PW15 transmitter. "The crack MRHS Transmitter Department has shifted all the KSM transmitters back to their original KPH frequencies, retuned the antennas, tested the keying, and advise that all will be in order for the resumption of KPH service," Dillman said. Doors will open at the RCA receive site in the Point Reyes National Seashore at 1900 UTC. It's hoped that Ray Smith -- the operator who signed KPH Bolinas/Point Reyes off the air in June of 1997 -- will do the honors. KPH will then pick up the thread and resume operations, just as it did for so many decades. Dillman said KPH will provide the same services coast stations always have -- radiograms to and from ships, high seas weather, and news of interest to the maritime community. Amateur Radio station K6KPH will be in operation too, listening for calls on 3550, 7050, 14.050, 18.097.5, and 21.050 kHz. K6KPH uses the original KPH transmitters (throttled back to 1.5 kW), antennas, and receivers. "When we began our project we would never have believed this day would come," Dillman said. Read more. Tad Cook, K7RA, Seattle, reports: Over the September 29 through October 5 reporting week, the average daily sunspot number declined 9 points to 20.7, and average daily solar flux increased from 81.4 to 86.7, relative to the previous 7 days. Average daily planetary A index increased from 19.7 to 21.4, and average mid-latitude A index increased from 12.3 to 15.1. Think that was bad? At the University of Alaska's magnetometer, which supplies us with the College A Index, the number rose to 73 on September 29, with the average for the week at 35.9. 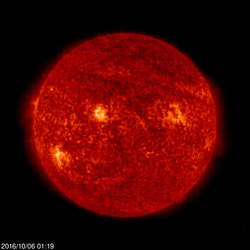 Predicted solar flux from the October 5 forecast shows 99 and 100 on October 6-7; 102 on October 8-12; 90 on October 13-14; 95 on October 15-18; 90 on October 19-21; 85 on October 22-26; 80 On October 27-31; 85 on November 1-2; 90 on November 3-10, and 95 on October 11-14. Predicted planetary A index is 6, 5, 5, 6 on October 6-9; 5 on October 10-14; 8, 10, 20, and 8 on October 15-18; 5 on October 19-22; 20 on October 23; 35 on October 24-26; 20, 15, 15, 12, 15, and 10 on October 27-November 1; 5 on November 2-10, and 10, 20, and 8 on November 11-14. Sunspot numbers for September 29 through October 5 were 17, 12, 0, 13, 32, 33, and 38, with a mean of 29.7. The 10.7 centimeter flux was 82.7, 80.6, 81, 82.3, 87.8, 93.1, and 99.3, with a mean of 81.4. Estimated planetary A indices were 39, 21, 19, 18, 14, 26, and 13, with a mean of 19.7. Estimated mid-latitude A indices were 22, 15, 14, 15, 12, 18, and 10, with a mean of 12.3.